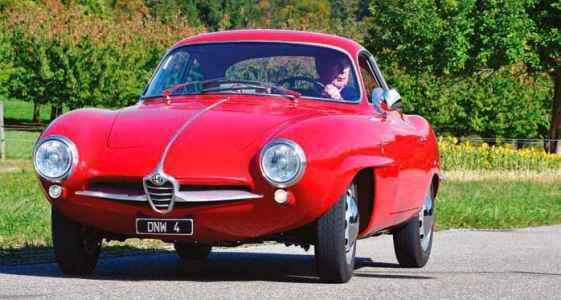 Alfa Romeo Giulietta Sprint Speciale World-first twin test of Alfa’s SS aero coupe. Shaped by the Wind… Scaglione’s wind-cheating Alfa SS was designed to win races, but it eventually ended up being marketed as a luxury sports coupe. We compare a very early 750 example with a later 101, and come away utterly charmed. Story & images by Peter Collins. Franco Scaglione was a truly remarkable man, even by the lofty standards of Italian car designers. 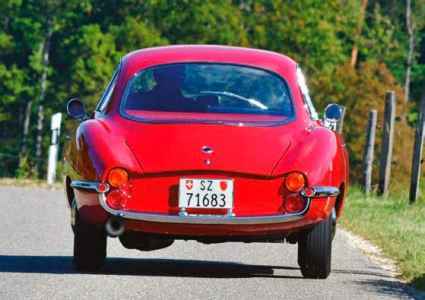 From drawings for Lancia Aurelias for Carrozzeria Balbo in 1951 to the Intermeccanica Indra of 1972, he stunned the world with his creations. And let’s not forget his immortal Alfa Romeo Tipo 33 Stradale, which has every right to be described as the most beautiful car in the world. 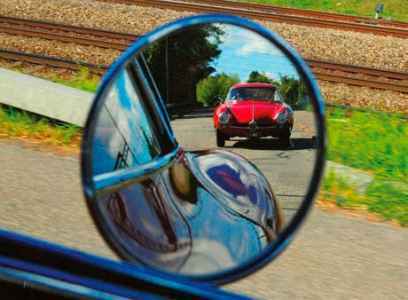 So before we take a detailed look at the two Alfa Romeo Giulietta Sprint Speciales on these pages, it’s worth assessing the impact of Scaglione on the design world. It was Scaglione who was arguably responsible for setting the design baselines for all the big three Turinese carrozzerie in the late 20th century, namely Pininfarina, Bertone and Italdesign. It was with Nuccio Bertone that Scaglione started. Nuccio believed in putting his trust in one senior stylist, with occasional reference to an outside consultant, instead of the ‘team’ approach adopted by others. He was an agitator of men, whose methods were similar to those of Enzo Ferrari. The Turin Show of 1952 was a watershed for Bertone. Famously almost on the brink of bankruptcy, its stand was visited by Stanley Harold ‘Wacky’ Arnolt from the USA, who was so taken by Bertone’s work that he commissioned a new body for the humble MG TD chassis for US customers. By 1953, that extended to Bristol chassis, too. Scaglione’s open sports racer design for Bertone became known as the ‘bolide’, while three extremely svelte coupes were built on the same chassis. Between them, these MG and Bristol-based cars saved Bertone. Franco Scaglione had been involved in style and shapes a lot earlier than this. Born in 1916 in Florence, he settled into fashion and dress creation but, although this was a success, cars were what he really wanted to design. He visited Pinin Farina, who appreciated what he was trying to do, but there was no real connection between the two men. It was Scaglione’s Fiat-based Abarth 1500 Berlinetta, which Bertone bravely committed to metal for the 1952 Turin Show, that showed the true genius and originality of Franco’s thinking. Indeed, it impressed the American executives of Packard so much that they bought it off the stand and took it back to the USA as a design study. Next came his three BAT (Berlinetta Aerodinamica Tecnica) cars. Initiated at the Turin Show in 1953 with BAT 5, the BAT 7 and BAT 9 followed in 1954 and 1955 respectively, all displaying gasp-inducing, yet logical, air-smoothing shapes. All were based on Alfa Romeo 1900 chassis. At the same time, Scaglione was charged with the design of a coupe to be based on Alfa’s upcoming new car, the Giulietta. 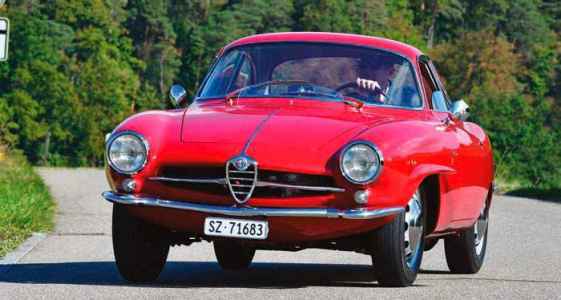 In fact, the final shape of the Giulietta Sprint, as the coupe was christened, was worked up in collaboration with Felice Boano at Ghia, and the prototype incorporated the world’s first hatchback (albeit opening laterally). The model was first introduced to the public in 1954, and such was the demand that Bertone was overwhelmed and resorted to Ghia to help manufacture them. The Sprint was taken to heart by the competition fraternity, but it lacked power for races like the Mille Miglia, so the obvious answer was a more powerful, lighter version. The factory came up with the Sprint Veloce, which incorporated exactly those advantages. Something more was needed, though. A crashed SV was eventually turned into an even lighter, smoother car by Zagato (called the SVZ) and racers were soon beating a path to the Zagato’s door. The shape at the front bore similarities to Franco’s BAT 9, but there was no Alfa Romeo badge on the nose, merely script announcing the car as a Giulietta Speciale on the truncated Kamm tail. It is interesting that it wasn’t until 1961, some four years later, that a tail of this sort was adopted for use on the final series of Giulietta SVZ cars. Every line was a testament to Scaglione’s inventive expertise. At this stage, there was no obvious sign that the Sprint Speciale might be adopted by Alfa. Extensive aerodynamic tests were carried out, some at Moto Guzzi’s own wind tunnel, which revealed that Franco’s ideas about aero shapes were entirely sound. The drag coefficient turned out to be as low as 0.28 – utterly remarkable for the time. 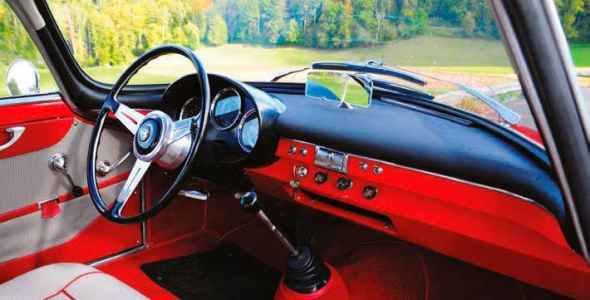 A second prototype appeared at the Geneva Show in March 1958, possibly merely the first car modified. The overhangs at front and rear were reduced, and the height of the roof was raised by 20mm. A third prototype then appeared at the Turin Show later in 1958, finally receiving the factory’s blessing and an Alfa Romeo badge. This had front and rear overhangs slightly reduced again. The rear lights were now in a horizontal row of three each side with reflectors in the middle of each set. Flasher repeaters had been moved from the front wings to just below the headlights and a transparent bug-deflecting aero screen was mounted on the bonnet just ahead of the driver. When the Sprint Speciale was finally launched on 24 June 1959 at Monza, further alterations were visible. The rear lights were now arranged vertically, five slots appeared in the bonnet to reduce pressure and help cooling, and the interior furnishings were more comfortable. The first production cars went under the generic title of ‘low-nose’ 750 SS. And we’ve been lucky enough to bring together one of these early cars, along with an example of a later SS (by which time several changes had been made to the model). First, though, what were the advantages of the SS over the SV? Firstly, the SS enjoyed a lower frontal area, which meant less drag. Gregor Grant, in his 1961 Autosport magazine road test of the actual low-nose example seen here, stated that, “undoubtedly the science of aerodynamics has been applied to the design, for rarely have I travelled in a car which has so little wind noise at high speed”. Another advantage of the SS was its five-speed gearbox. Jason Wright, the current owner of the low-nose, told me that driving an SS from Italy to the UK was, considering it has only 1290cc, a sheer delight. In fifth gear and with the shape of the bodywork, motorway work was as relaxing as any modern, larger-engined car. 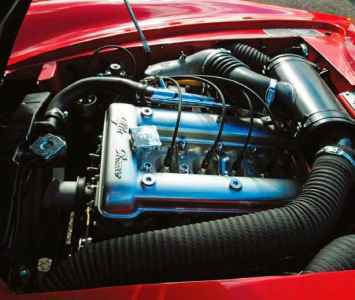 Alfa Romeo presented the car as factory competition for the Zagato-built SVZs, but it quickly became apparent that the extra weight of the longer bodywork compared to the SVZ effectively negated the SS as a contender. So where did that leave the Sprint Speciale? The first production run – 101 Series cars required for motorsport homologation – were of the low-nose specification. That can clearly be seen on the example registered DNW 4. 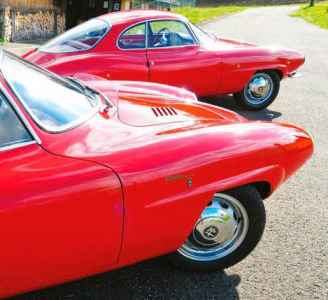 These cars in general had steel bodies with aluminium doors, bonnet and bootlid, but a very few lightweight ‘alleggerita’ cars were constructed entirely out of aluminium. Although Sprint Speciales were used in competition, they raced far less frequently than SVZs. There were some notable results nevertheless, such as Riolo/Federico coming 13th overall and winning the 1300cc class in the 1960 Targa Florio (beating an SVZ!). At the later Nürburgring 1000km race, Stangl and Degner finished second in the 1300cc class. Despite this, it was clear that for the best results you needed an SVZ, so Alfa rethought the future of the SS. It decided to relaunch it as a top-of-the-range coupe, modifying many details to achieve this. Aluminium was retained only for the bonnet and bootlid, glass replaced Plexiglas and the nose was raised by 70mm. We were lucky enough to find two SS cars, one from each of the first two production runs and, possibly for the first time in print, compare them together. From the front, the earlier car is easily identified by its ‘droop snoot’ nose, looking almost like an anteater, with the Alfa Romeo grille and badge seemingly perched on the tip. In comparison, the later car has a raised and softened look, with a slim bumper for protection. Note the bug deflectors at the back of both bonnets. At the tail end of the later car, the bootlid extends to, and includes, the edge of the rear bodyline. In addition, the dainty bumperettes of ‘DNW’ are supplemented by a full-width bumper that hugs the lower bodyline, and has reflectors in each outer corner. On the sides, the Giulietta Sprint Speciale badging is similar, although it’s nearer the A-post on the later car, which also has flashing side repeaters. Inside, the ignition switches are on different sides of the steering wheel in each car, the door cards are of different designs and the dials in the dashboard are transposed with the rev counter in the middle on the later car. To drive, both cars are well endowed with all the usual Giulietta advantages, such as superbly precise handling. Writer Gregor Grant commented: “As for understeer or oversteer, I feel that the car possesses something in between – in other words, it is just right!” The steering is accurate and beautifully weighted. Performance is amazing for just 1290cc, with a top speed of over 120mph. The noise levels are unexpectedly low, too, thanks to Scaglione’s slippery body shape. 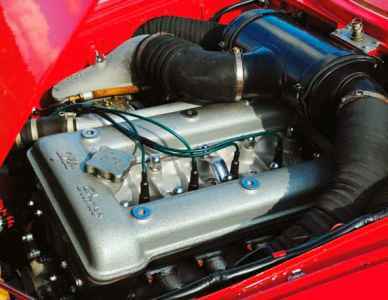 The SS never fulfilled its intended function as an all-out competition car for Alfa Romeo. 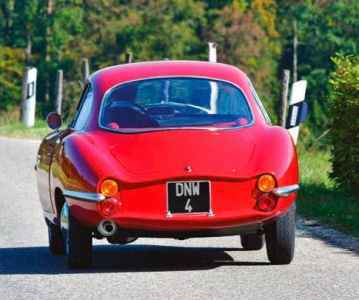 The failure of Franco’s Alfa Abarth 1000 Berlinetta to be taken on by Arese was another reason why there was eventually a falling out between Scaglione and Bertone. None of that should detract from the fact that the SS was a glorious example of Franco’s ingenuity, gut feeling and understanding of fluid shapes. It does no harm that the SS looks so good, either. Original intended role as a competition car it didn’t pan out, so SS was reimagined as a luxury coupe. Later car (above) contrasts with ‘droop snoot’ shape of earlier SS (above right). Detail differences abound.